“I got to go. I can’t be here.” Those were the last words of former Kansas City Chiefs linebacker Jovan Belcher, spoken in the parking lot of the team’s practice facility on the morning of December 1, 2012. Less than an hour earlier, Belcher had murdered his girlfriend, Kasandra Perkins, shooting her 9 times during an argument at their suburban Kansas City home. Belcher’s mother, who was living with her son at the time and helping take care of his 3 month old daughter, ran into the couple’s bedroom and found her son kneeling on the floor beside Perkins, begging her for forgiveness as she bled out. After kissing his girlfriend on the forehead, he did the same with his infant daughter and apologized to his mother before leaving the house and ending his life with a gunshot to the temple in front of the Chief’s general manager and head coach. A year and a half later, a medical report was released that showed that Belcher’s brain showed signs of chronic traumatic encephalopathy (CTE), a neurodegenerative disease caused by repeated head trauma that results in dementia, depression and memory loss. Jovan Belcher was only 25 year old. 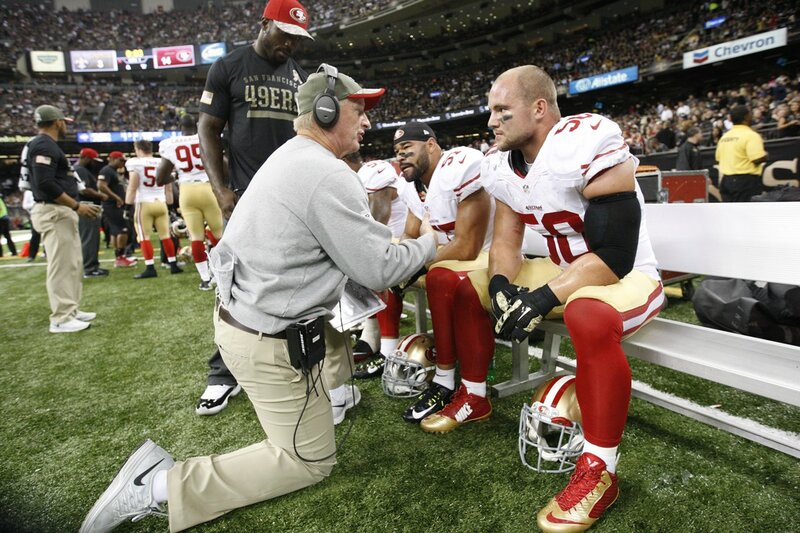 On Monday, San Francisco 49ers linebacker Chris Borland heeded the experiences and suffering of men like Belcher and decided, at the age of 24, to retire from the game of football, sending shockwaves through the sports world. Borland’s announcement was alarming, not so much because of his age, but because of his rationale for leaving the game.As Grantland’s Bill Barnwell points out, Borland isn’t the first football player to retire in his prime—he isn’t even the first 49er to retire early this year, with his announcement being preceded by that of his all-pro teammate Patrick Willis—but he is the first to use preemptive action against head trauma as his primary reason for doing so. For many looking in from the outside, the decision of a young man to walk away from his dream job and, at the very least, the financial security that would come with the last 3 years of his 4 year, nearly $3 million contract, but for Borland, the risk of life-altering brain damage wasn’t worth the reward of NFL stardom. A second year linebacker out of the University of Wisconsin, Borland was one of the few bright spots in an otherwise dismal year for the 49ers that saw the team miss the playoffs for the first time since 2010 and lose their oft embattled, but incredibly successful head coach Jim Harbaugh to the University of Michigan. A 3rd round pick in last year’s NFL draft, Borland emerged from relative obscurity to lead the team in tackles in 2014 and was slated to take over for the recently retired Willis at inside linebacker and become an integral part of the 49er defense. Borland’s announcement has produced a rash of articles from everyone from The Washington Post and The Baltimore Sun to Forbes asking if this is the end of football as we know it. The answer to that question, as evidenced by Super Bowl XLIX’s record high TV ratings, is a pretty emphatic no. If the NFL could cap off a season that featured the almost incomprehensible mismanagement of a domestic violence scandal and the suspension of the league’s star running back for beating his young son with a tree branch with the most watched television event in American history, the early retirement of a linebacker making the league minimum isn’t going to put much of a hitch in their step. With that being said, the retirement of Chris Borland does signify a shift in the demographics of NFL rosters in the coming decades. Borland, the son of a financial planner in Dayton, Ohio, appears to be on the forefront of a growing trend of upper-middle and middle class Americans who believe football to be too dangerous a sport for their sons to play. A recent Bloomberg poll indicates that more than 6 in 10 wealthy and college educated Americans don’t want their boys playing football, a development that isn’t crippling to the NFL’s future, but will certainly change the socioeconomic makeup of its players. At the present, it looks as if the future of football is akin to that boxing—a sport that was wildly successful, but whose talent pool consistently drew from the most marginalized portions of society. Ask your average upper-middle class father if he wants his son to play football and you might encounter a great deal of opposition to the idea. However, ask that same father if he’s willing to stop rooting for his alma mater on Saturdays or his NFL team on Sundays and you’ll get a much different response. Sure, many of us feel increasingly guilty watching a game in which men batter their brains and bodies for our entertainment, but we don’t stop watching and, given our collective response to the deaths of men like Javon Belcher, it doesn’t look like we will anytime soon. Great article as usual, thanks for what you do.